As we walked toward the pier, the first thing we noticed was the cute children's activities and paintings on the walls of the building. 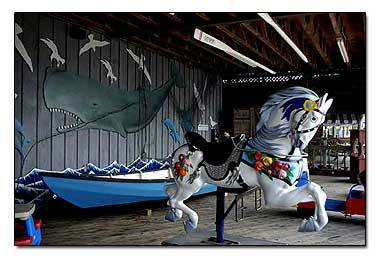 They have 2 fun mirrors, and a boat kids can sit in, and a beautifully painted wooden carousel horse. 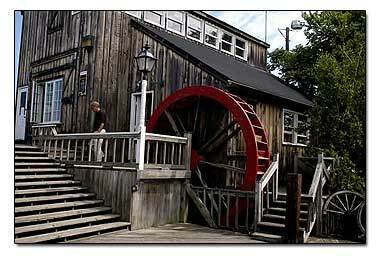 If you walk to the far end, they have built a mill with a water wheel. It wasn't in operation when we were there, but I'll bet it works. Other things you'll notice, as you walk around the pier, is a large old anchor with huge ropes decorating the end of the pier. Painted plywood cutouts, that you put your head in to get a fun camera shot. Signs everywhere telling you how far it is to say, London, New York, Moscow, etc. The directions to Captain's Cove Seaport are simple. On I-95 from north or south, Exit 26 to Bostwick Ave. following Captain Cove's well placed signs. Captain's Cove is also close to the Ferry Memorial Seaside Arch and the Bridgeport beach, so you could visit there too and see the lighthouse. Traveling Tip: One thing to say about traveling to Captain's Cove, is that you are going to feel like you're lost, because of all the empty lots and old factories left from days gone by. This quaint Captain's Cove tourist spot is stuck at the edge of nowhere. Bridgeport used to be a hotspot for tourists in the early 1900's and used to be called Park City. Cooltan Tan Through Shirts and Swimwear - Get a tan through your clothes! Shirts, shorts, and swimwear. Great for wash and go traveling. Child Travel Tips - How to keep the kids busy while traveling. Travel Scrapbook - Make a scrapbook while on vaction. Connecticut Peapod - Save time and money, grocery shop online in Connecticut. Peapod delivers groceries right to your door at the time that you select. Stop and Shop CT Peapod - Get $10 in FREE groceries in CT. Order anytime, day or night 24/7.